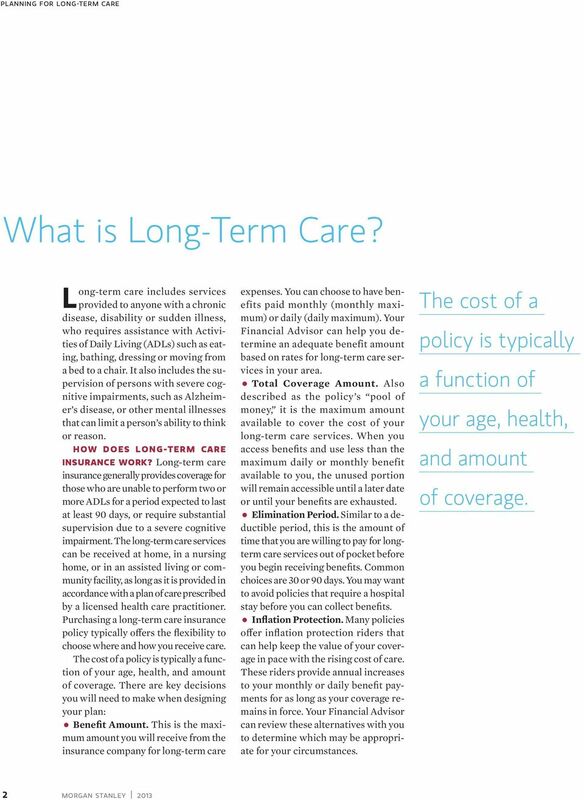 Download "Planning for Long-Term Care"
1 long-term care insurance october What is Long-Term Care? 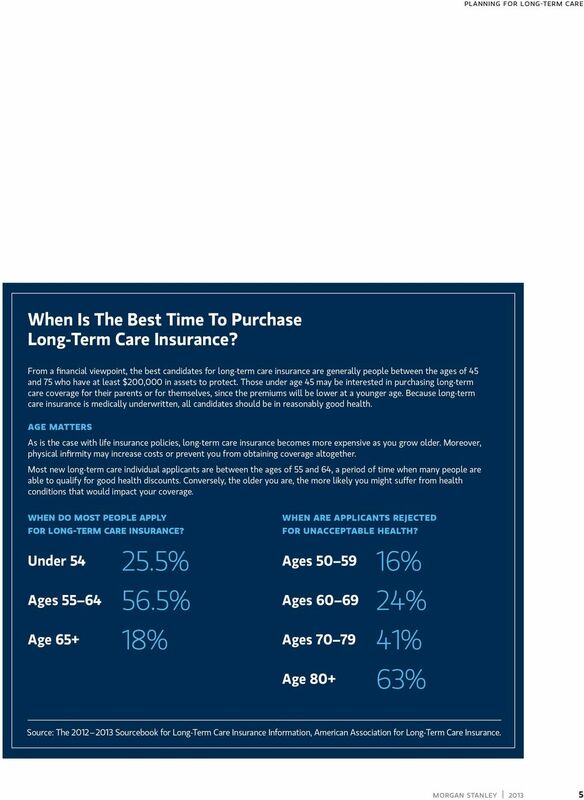 4 Why Should You Consider Long-Term Care Coverage? 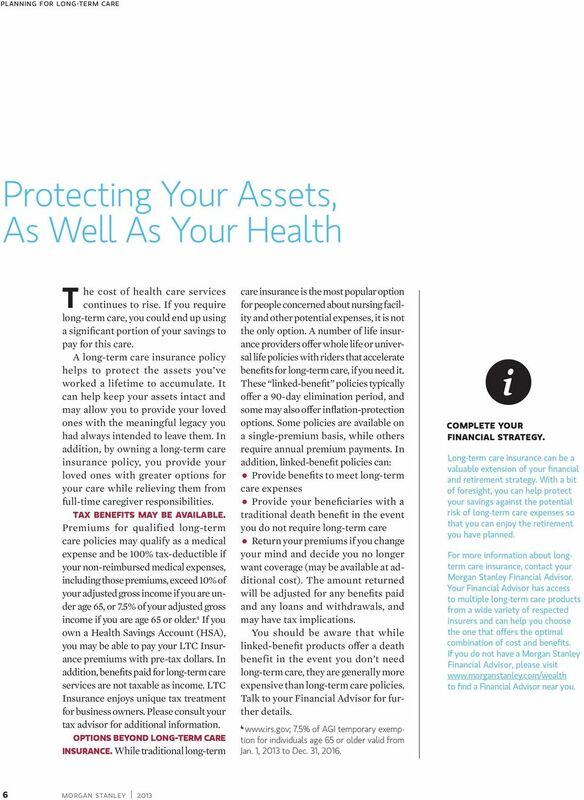 6 Protecting Your Assets, As Well As Your Health Planning for Long-Term Care summary the high cost of long-term care You may have spent years carefully working and planning so that you have sufficient income for a comfortable retirement. You may think that your retirement savings are protected; but have you ever considered what might happen if you or your spouse required long-term care? 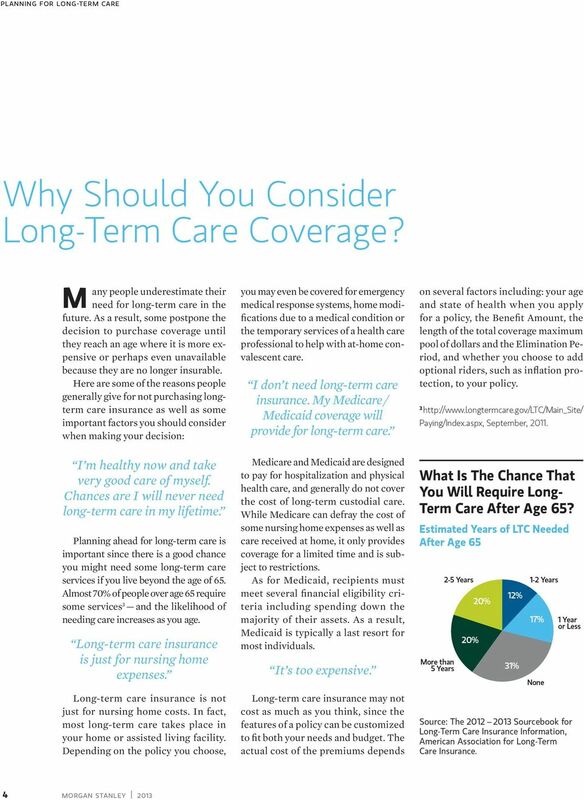 The cost of long-term care services provided in the home, at a community facility or in a nursing home may not be covered by Medicare or other medical plans. With the median annual cost of a private room nursing home stay currently hovering around $83,950 1 and the median cost of in-home care assistance at $44,479 2 per year, the expenses can deplete your retirement savings. These figures do not take into account lifestyle choices and extra amenities. Quality care and facilities could cost well into the six figures annually. 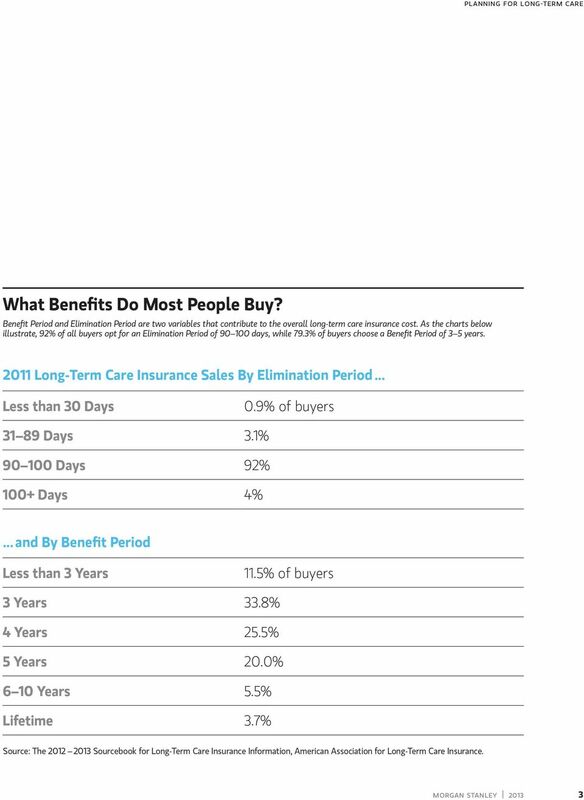 To mitigate this risk and help protect their retirement portfolios, many people purchase long-term care insurance. By paying an annual premium, you can help transfer the financial risk of long-term care to an insurance company. Equally as important, long-term care insurance can provide you with the freedom to choose the type of care you want. Long-term care costs have soared in recent years and are expected to rise even higher. According to the Genworth 2013 Cost of Care Survey, here s what you can expect to pay for a private room in a nursing home, assuming a 5% annual increase in costs. 1 year of care 3 years of care 5 years of care Cost today $83,950 $264,652 $463,877 In 10 years $130,234 $410,563 $719,625 In 20 years $212,137 $668,763 $1,172,193 Figures in the table were computed by Genworth based on information from the 2013 Cost of Care Survey and represent room costs for an individual. 1 Genworth 2013 Cost of Care Survey, page 7, conducted by CareScout 03 / Genworth 2013 Cost of Care Survey, page 6, conducted by CareScout 03 / 13. Annual cost computed based on $19 per hour and 44 hours of help per week. SELLER S GUIDE LTC Rider Seller s Guide PROTECTION What you need to know about Long-Term Care and John Hancock s LTC Rider LIFE-4225 6/14 For agent use only. This material may not be used with the public. 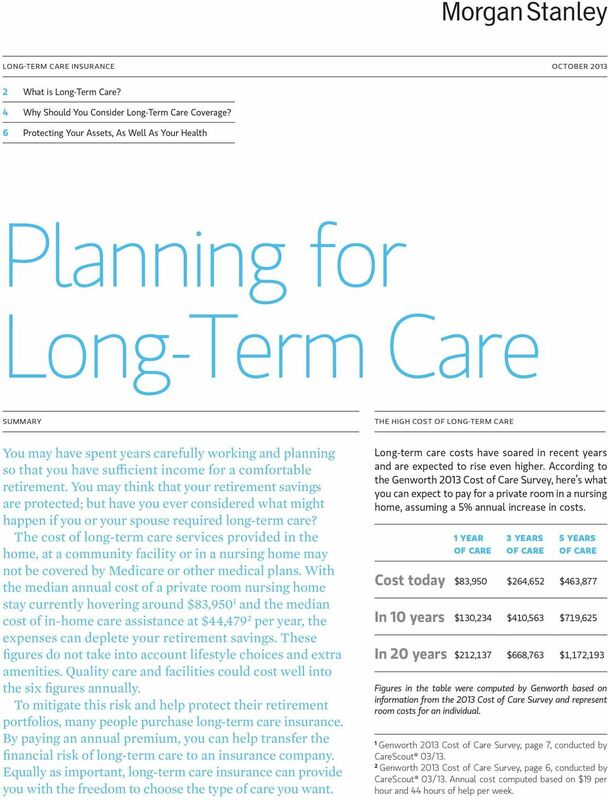 This booklet is designed to help you understand long-term care insurance and how it can help you prepare financially for future long-term care needs.